Crack in the Antarctic! | Watts Up With That? From the University of Texas at Austin, a press release to tell us the ice shelves in the Antarctic peninsula are losing their grip and cracking a bit. That could be tragic, except, well, sea ice in Antarctica is growing. Average velocities of Pine Island and Thwaites Glaciers were measured for the time periods between 1992 and 1994 by tracking ice-surface patterns. Velocities of the central flow of the Pine Island Glacier range from 1.5 km/yr above the grounding line (separating the grounded from the floating parts of a glacier) to 2.8 km/yr near the terminus; velocities of the central Thwaites Glacier range from 2.2 km/yr above the grounding line to 3.4 km/yr at the limit of measurements on the tongue. Both glaciers show an increase in velocity of about 1 km/yr where they cross their grounding lines. The velocities derived from ERS-1 images are higher than those previously derived from Landsat images, perhaps reflecting acceleration of the glaciers. Both glaciers are exceptionally fast. The high velocities may be due to high precipitation rates over West Antarctica and the lack of a major buttressing ice shelf. …”This is the first time we have seen a volcano beneath the ice sheet punch a hole through the ice sheet” in Antarctica, Vaughan said. Volcanic heat could still be melting ice to water and contributing to thinning and speeding up of the Pine Island glacier, which passes nearby, but Vaughan said he doubted that it could be affecting other glaciers in western Antarctica, which have also thinned in recent years. Most glaciologists, including Vaughan, say that warmer ocean water is the primary cause of thinning. Volcanically, Antarctica is a fairly quiet place. But sometime around 325 B.C., the researchers said, a hidden and still active volcano erupted, puncturing several hundred yards of ice above it. Ash and shards from the volcano carried through the air and settled onto the surrounding landscape. That layer is now out of sight, hidden beneath the snows that fell during the next 2,300 years…..
How did it change between 1972 and 1979 when all the other polar ice coverage data starts? Amazing how they can suddenly find earlier data when it suits the narrative. So excited you left out ‘get’. I’m excited too. Hopefully, many other commentators will also get excited as they should with most of your finely excited posts. But I digress. In Scotland they have recently ceased the plantation of grasses on sand dunes as a means to stop erosion. A sand dune ecosystem relies on wind changing the structure of the dunes. Similarly, what’s the problem with Antarctic ice sheets dynamically moving into a position relative to the natural systems around them. Changing glacier flows are a natural occurrence. Where does the now paradigm of glacial theory say ice sheets move in a never ending extension to the Oceans? We’re all going to die…aaaargggaahhh! Since when could ice shelf extent be compared to Antarctic sea ice extent? Apples and pears, surely? No connection, of course. Because the shelf ice never goes to sea, but to Niburu. Southern Hemisphere sea ice can extend to roughly 50 degrees south. Moreover, Antarctic sea ice does not extend southward to the pole; it can only fringe the continent. Because of this geography, the Antarctic’s sea ice coverage is larger than the Arctic’s in winter, but smaller in the summer. Total Antarctic sea ice peaks in September—the end of Southern Hemisphere winter—historically rising to an extent of roughly 18 million square kilometers (about 6.9 million square miles). Ice extent reaches its minimum in February, when it dips to roughly 3 million square kilometers (about 1.2 million square miles). This looks like an interesting glaciological study and should improve our understanding of the mechanics of accelerated glaciation. It also focuses on possible positive feedbacks and improving computer modeling of glaciation. Why not? Good science, I say. No mention of CAGW – simply observation of accelerated glaciation in this (small) area of West Antarctica. But I guess the alarmists will tout it as proof of some imminent tipping point, rather than consider the short time frame and small area of the study. The rest of this enormous continent is doing all sorts of growing, calving, shrinking, snowing, expanding, freezing, melting – has been for a gazillion years. The description given in the last table on the page above indicates that the variation in minimum and maximum extent is quite large for Antarctica. And also that the ice loss is greater in the Arctic by percent than the gain in the Antarctic. However given this discussion is about sea ice as opposed to talking about land ice wouldn’t it be expected that that sea ice increases as ice calving increases and this is a consistent mechanism with the rifts found in the Thwaites glacier? In other words, isn’t it a real indication of this process actually requiring comparison with land ice? It seems to have no context to me otherwise. It’s ok we don’t really exist we just think we do! The same phenomenon must have taken place countlessly from time immemorial. 1) Isn’t this on / near the warming peninsula? That part of Antarctica to have a bunch of volcanoes and warming dirt under the ice? As the rest of Antarctica is getting colder, to have ice growing where it’s colder and breaking off a bit where the land is warming seems quite reasonable. So I think it’s an interesting observation on the ice sheet and land mooring at the margins, but think it’s more likely related to #1 and #2 above and unrelated to air temperatures. I’m gunna get famous by inventing a new word for this hitherto unknown phenomenumenum. I’m gunna call it “calving”.. I seem to recall somewhere, a few years back, seeing a little bit of math about the size of this bay they are speaking about. I wish I could recall where….. However, it something along the lines of this region being 2% of the Antarctic peninsula, which was 2% of the entire continent. Can anyone verify that? And if that is anywhere near close, can anyone tell me why focusing on .4% of the continent, equates to the entire continent, in the minds of AGW True Believers? It’s great to see that they are prepared to go back to 1972 for Antarctica. Will the IPCC do it again for the Arctic or will they continue to delete records in any forthcoming report? In the meantime what’s the panic when over the period Antarctic sea ice has grown? Sea level has been plummeting for four years, and is lower than it was in 2003 when EU’s Envisat satellite was launched. Even the Guardian is alarmed. Reporting in the Journal of Glaciology, the UTIG team found that the extent of ice shelves in the Amundsen Sea Embayment changed substantially between the beginning of the Landsat satellite record in 1972 and late 2011. These changes were especially rapid during the past decade. But looking at this graph of Pine Island glacier velocity, at least from 2005, there seems to be a plateau in velocity. This would depend upon thermal activity under the glacier and more detail about this by the authors would be welcome. Here is an overview of Pine Island glacier. Careful what you’re doing to people who read your posts early in the morning before they’ve had enough coffee to get going. While the direct observation may only cover 40 years, the ice SHELVES (not sea ice) that are being observed CAN be dated and so the context is of large ice shelves which have been stable features at least throught the Holocene starting to collapse, long after the post-glacial Holocene maximum. In most previous interstadial cycles these ice masses would be expanding, not shrinking several thousand years after the maximum post-melt temperature. Ice shelves losing their grip, eh. Where’s Garfield when you need him? 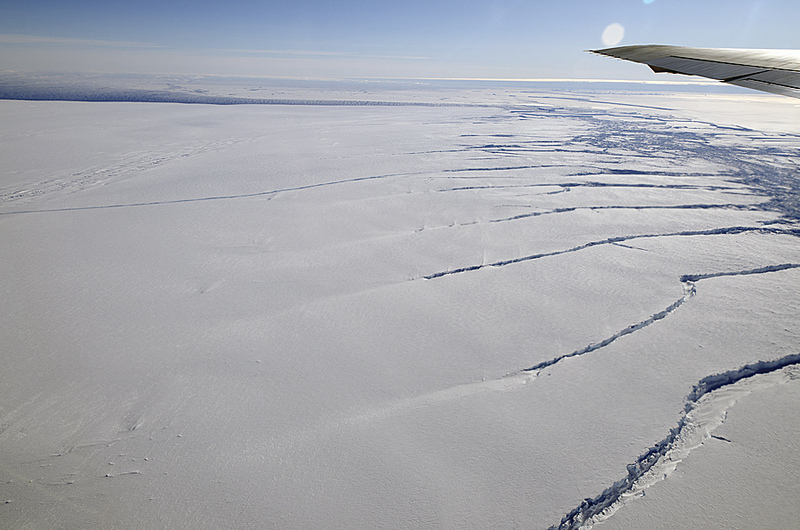 “West Antarctic Ice Shelves Tearing Apart at the Seams”. I read this quickly as, “West Antarctic Ice Shelves Tearing Apart at the Scams”. Somehow this seems to be more likely than the originally intended heading. Dang! Drugs are everywhere now…. oh wait…. nevermind. Ice breaks up floats in sea……… Titanic meet Iceberg! Really, who pays for all this twaddle? Oh don’t ask, its you and me. How was it changing before LANDSAT? Ay, there’s the rub! As if it is known from our limited observation in time and space, what is “typical” in Antarctica and what is anomalous. A few years ago, there was talk about volcanic activity up and down that region of west Antarctica. Sea ice has little to do with shelf ice, so the comparison is meaningless. I remember very long-period ocean waves (“infragravity waves”) being implicated in the collapse of Antarctic ice shelves like with the Wilkins Ice Shelf breakup events in 2008. Worrying about CO₂ ain’t gonna save these shelves. But it may indicate the Southern Ocean might be a good place to test those future ocean-based renewable-energy wave generators, as besides dragging out “climate change” as a project justification, they can claim the need to intercept all that energy before the ice shelves collapse yielding a 3 meter (+0.01/-3.01) sea level rise. Hansen would be pleased. …ice shelves in the Antarctic peninsula are losing their grip and cracking a bit. They mentioned acceleration of the ice flow which would indicate increased snowfall.If the average temp in Antarctica is -40 c then logic dictates it’s not melting ,I would suggest that our Beautiful Planet with it’s EVER CHANGING CLIMATE is F——-G with their tiny brains.Climate Change is Natural get over it. …so the context is of large ice shelves which have been stable features at least throught the Holocene starting to collapse, long after the post-glacial Holocene maximum. No, they’re not starting to collapse. They’ve become detached, most likely due to volcanic warming. It’s now autumn in the Southern Hemisphere — in a few months the rifts should be frozen over again. In most previous interstadial cycles these ice masses would be expanding, not shrinking several thousand years after the maximum post-melt temperature. Ahem — what is it about “recent volcanic ground warming” that you didn’t understand? As I see it, the ice that slides off the continent into the sea has two options. It can either break off and float away and melt, or it can keep on expanding Northwards. Do they have any evidence that it has done the later in the last 10,000 years, if so I think we should be told. So they don’t know if what they describe is common nor unusual. sea ice in Antarctica is growing. So the article is about land ice and Anthony mentions sea ice. Is anyone here confused by the distinction? Maybe land ice moving faster means the Antarctic is getting warmer. Maybe more land ice melting is making it easier for seawater to freeze and make more sea ice? Johnny Weissmuller played Tarzan in several movies, swinging from the vines with bravado. Later, he had the misfortune of dementia and was put into a care home. One evening he made a leap from a balcony to swing on a chandelier, but failed. Unkind newspaper headlines next day were “Tarzan Loses His Grip”. Sorry, I thought this was a page about cracks about the Antarctic. These should be added to that article to give background information..
With all that potential water vapor locked up in ice, on the north and south poles does anyone else think that this could mean a dry spell for some areas this year? Yeah, I know what you mean. I read “Crack In The Antarctic” and thought OH MY a large earthquake was cracking the Antarctic glacier. Something akin to what is being seen in Africa. ….here, on the edge of Africa, the continent is splitting apart. Pulled inexorably by the grind of tectonic plates, Afar is ripping asunder like a gateway to hell. Molten rock wells up from below, pouring onto the sweltering surface. Yet for all the fire and brimstone, Afar is on its way to a watery end. A million years or so from now, the geological processes that rip the continent will give birth to a new seafloor. And Afar will lie at the bottom of Earth’s freshest ocean. 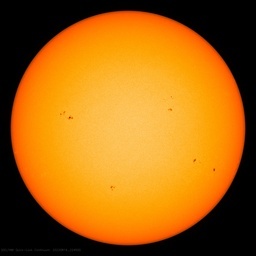 Until then, researchers have a front seat to an unparalleled physical spectacle. “It’s a really unique opportunity to understand how continents break apart,” says Tim Wright, a remote-sensing expert at the University of Leeds in England. Wright leads a large international consortium that began studying the region in 2005, when the splitting picked up pace….. Exciting stuff! Well at least if you like Geology. I though this was something similar instead it is just the usual Greenie twisting of facts. Now, as I understand it, an ice shelf is ice that is anchored to land and extends out over the water. It would seem to me that if the ice thickness were to increase, it would reach a point that the end would be too heavy (because it is not supported by land) and there would be a break. So, cracking of an ice shelf could be because it has gained too much weight. I am no scientist, so I would appreciate it if someone would correct me if I am wrong. Just looking at those pictures above, I am not sure they can really tell us anything, given the difference in visible surface features. First, you know the climate changes or it doesn’t. If you know it does change then it must either get colder or warmer and get more or less precipitation. Therefore, any reasonable thinker would understand the ice will change. So more ice is proof of Global Warming! And less ice is proof of Global Warming! This crackin the Pine Island Glacier was first noticed 12 years ago. It has hardly changed at all since that time. They just keep flying over it, again and again, and sounding the alarm as if it were new. First satellite picture of it from 2000. Earth Observatory article talking about it showing pictures from 2001. In fact, the current 2012 images show the crack is not as wide as it was 12 years ago. Sorry to troll you sir, but 2% of 2% is 0.04% – ya lost a zero there. Yes, over a period of 30-35 years the trend of the Antartic sea ice is growing. But if we might say that the global temperature is not rising anymore since 2008….then we have to be honnest and say also that the Antartic sea ice is not growing anymore since then ! More “warming-like people” can possibly say that the Antartic sea ice is declining since 2008…and there is no argument in the observations to contradict them ! Most glaciologists, including Vaughan, say that warmer ocean water is the primary cause of thinning. Silly me. Here I’d always thought that glaciers moved over *land* — and a combination of sublimation and a dearth of snowfall was the primary cause of glaciers thinning. We need to separate cause from effect here. The cause of West Antarctic glacier retreat might be AGW, it might be ocean cycles, it might be something else. But as a practical matter we are not interested in causes, we are interested in effects. What are the effects of West Antarctic glacier retreat? More ocean exposed to the atmosphere and more ocean heat loss. Resulting in a temporary rise in atmospheric temperatures, while the ocean and the climate cools (almost all the climate’s heat is in the oceans). I think one consequence is increasing SH sea ice, which is a powerful negative feedback – ice has a higher albedo than open ocean. In all likleyhood increasing sea ice will net out with decreasing land origin icesheets, but wouldn’t discount a negative feedback over 1 and net cooling as the effect over a decade or 2. How about what the ocean currents are doing there?? Tragic? Why tragic? Ice shelves grow, they crack and fall away, and grow again. Normal. When they grow and DON’T sheave off, then we’ve got a problem — it’s called an oncoming ice age. It should be comforting to know that the ice is going through its normal cycles. I’d say that it’s something more than just the ice shelves that is cracked here. Per Wikipedia the Greenland ice sheet amounts to a mere “If the entire 2,850,000 cubic kilometres (683,751 cu mi) of ice were to melt, it would lead to a global sea level rise of 7.2 m (23.6 ft). – yes 2,850,000 cubic kilometers. I am not a matematician but I can divide 100 cubic kilometers into 2,850,000 cubic kilometers and arrive at 28,500 years. Too early to worry about a 7.2 m sea level rise. Furthermore the record melt was in 2007 so each year 2008-2011 saw less melt!!!??? What a load of propaganda. perhaps it is because the Holocene is estimated to be one of the three warmest interglacials in the past 3 million years. It is a heck of a lot more complicated than that. Some glaciers are melting, some are increasing in size. list of the specific glaciers that are growing Greenpeace or WWF will be only to happy to list those that are shrinking. An abrupt transition to recurring positive phases of the NAO then occurred during the 1979/80 winter, with the atmosphere remaining locked into this mode through the 1994/95 winter season. During this 15-year interval, a substantial negative phase of the pattern appeared only twice, in the winters of 1984/85 and 1985/ 86. However, November 1995 – February 1996 (NDJF 95/96) was characterized by a return to the strong negative phase of the NAO. Halpert and Bell (1997; their section 3.3) recently documented the conditions accompanying this transition to the negative phase of the NAO. It is astonishing to see the cavalier attitude displayed by so many commentators on this thread. A casual reader might get the impression that this is some sort of table top exercise, being played by sophomores in a science lab. This study is one of many, all part of a vast mosaic, which, when taken collectively, contributes to a picture of a changing polar picture, As the study shows, this change is observable from satellites. These observations should not be dismissed out-of-hand. While it may be difficult for the lay person to understand the full context of change in the polar regions, given that most of us don’t have access to all of the other studies, we can (if we chose) rely on summaries provided by experts in the field, and other relevant bodies such as the IPCC. Two questions: 1) how large is the ice extent supposed to be in the the antarctic and 2) When if ever is it acceptable for these ice masses to crack or fracture? If you can define what the normal state for what Antarctic ice should be right now then we can compare it to these “changes” that we see occurring. It’s as if Warmers believe the earth is in some kind of unchanging stasis where only the actions of mankind upset some a perfect delicate balance that snowballs into certain catastrophe. Oh wait, that is what they believe. The faster a glacier grows out onto the sea surface, the bigger and more frequent are the lumps that fall off. That’s what “growing” means. Hugh Pepper is a dopey “lay person” who has no clue about anything scientific. If I am wrong, Pepper needs to post his verifiable CV here. But the fact is that Hugh Pepper is a complete scientific illiterate who gets his talking points from alarmist echo chambers. Prove me wrong, Pepper. Post your CV. The Arctic sea ice is always referenced from 1979 (+/-), with the implicit statement that prior to 1979 the ice extent was always (!) similar to 1979. The Antarctic sea ice graph should make a comparison to the same period of time, which means that the current ice extent is now about one quarter of a million km2 greater than currently shown. An overlay graph with a similar start-point would make a good comparison of what is going on. It’s not supported by land, but that does not mean it is not supported. It is still supported by water. On the other hand, as the amount of sea ice gets bigger, it will have more surface area, which means that winds and currents will pull on it more strongly. In other words, the bigger it gets, the easier it is to break free. Can’t improve on this! Very well said! Sea level has been plummeting for four years, and is lower than it was in 2003 when EU’s Envisat satellite was launched. This is solid proof that Greenland and Antarctica are melting down at unprecedented rates and flooding the oceans with negative water. 1. The breaking off of ice shelves is a cyclical process. A year or so ago, there was a great clip of time lapse images that showed how the shelf ice breaks off periodically, reforms, and then does it all over again, with no real net, long-term change. 2. 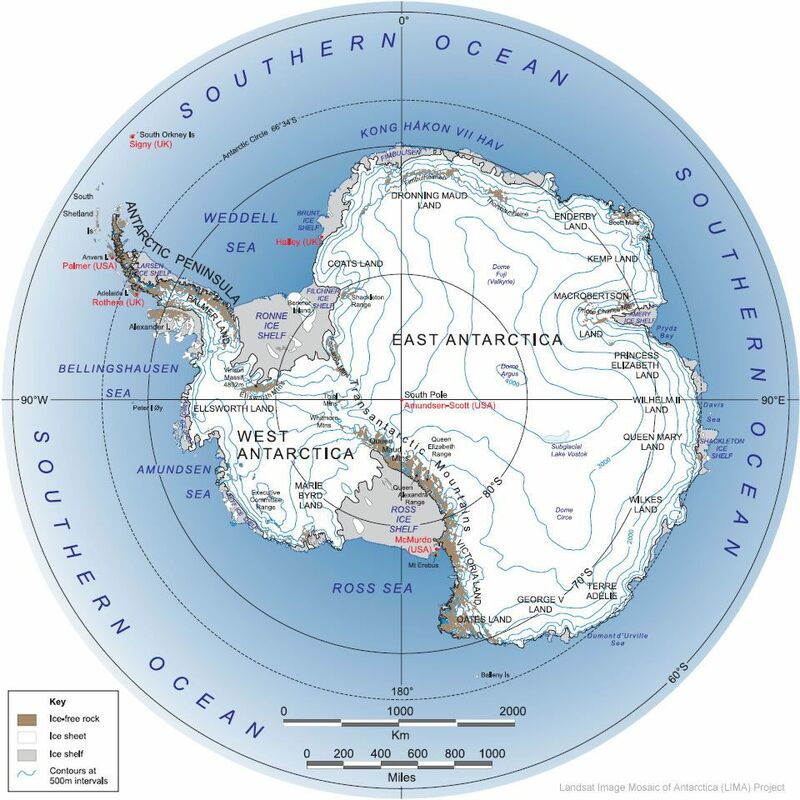 This is the Antarctic Peninsula, not the main ice sheet, and, as the authors point out, most of the melting comes from warmer ocean water around the peninsula, not from changes in air temp. 3. Because of (1) and (2) above and the tiny amount of ice involved relative to the huge ice sheet, ice shelf activity is a pretty poor place to judge what’s happening climatically. 4. It’s very clear that the Antarctic ice sheet is not melting–in fact it’s growing. The average annual temp on the ice sheet is about -58 degrees F so to get any significant melting you would have to raise the temp 58 + 32 = 90 degrees just to get to the melting point and it would take a temp rise of around 100 degrees to melt much ice. No sea live rise worries here! Quick question – are we using the same satellites in 2011 as we had in 72/73? No. They’re comparing pictures from Landsat 1 (72-78), with pictures from Landsat 7. Landsat 1 only had a 79m resolution (about 260ft), while Landsat 7 has a 30m resolution (about 98ft). So while we may have satellite images covering a period of 40 years, we still can’t see a crack in the ice today till it reaches about 98ft wide. Some of the observable changes might be because we’ve made advances in imaging – a “crack” seen today may not have been seen in 72/73. The ice only LOOKS smoother back then because of the resolution. Why not? So ice moved. That is what the ice sheets are supposed to do. Just think how deep the ice would be on Antarctica if it didn’t. Tragic? Really Anthony, that’s a bit over the top don’t you think? It is sea ice and won’;t make a bit of difference if it breaks off or not as far as sea levels go. The only danger is icebergs and I haven’t heard of them causing too many problems since the Titanic hit one. This is just more scaremongering by the watermelons. Glaciers only flow if more ice is being added to them. If they are now flowing so fast as to be buckling and breaking sea ice from the force of their flow, as you see in those images, that means ice on Antarctica is increasing. Which is exactly what the satellites show, and completely contrary to the unsupported nonsense in the source article. By the time the top of the glacier reached the stratosphere, it would stop. Pretty hard to get more snow on top at that level. Amplified acceleration. Huh? Redundant much? 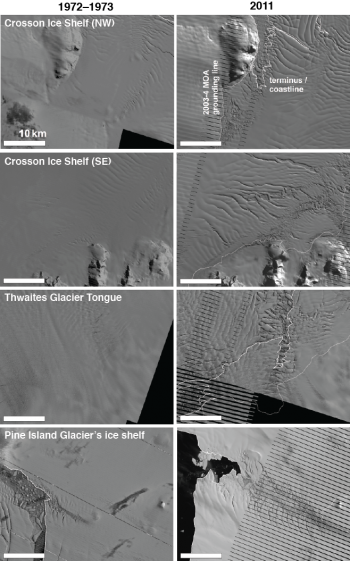 The ice shelves are cantilever structures buoyed by the ocean. The greater the moment arm the greater the tendency to crack. This is basic engineering. Helllllllooooooooo! How does one differentiate East Antarctica from West Antarctica. I can figure North and South. I guess it must be through Longitude. This is all good. I, for one, can’t wait to vacation there. Under the swaying palms. Me and my Corona. Move along now; nothing to see here. I have a photo that Svend Hendriksen sent me, that was of that earlier ice shelf (not Larsen B) that collapsed on the Antarctic peninsula. Svend pointed out an ajacent area of shelf, that had collapsed 50 years earlier and grown back but now lower level than the surroundings, which had another 50 years of snow deposits. So 40 years of observations, isn’t nearly long enough to find out what is standard operating procedure for these ice shelves. And how many times do I have to say that the whole Pacific and Atlantic oceans go sloshing through that gap from the AP to Cape horn twice a day, back and forth. and the article does say they are FLOATING ice shelves, so when the sea goes up and down, they behave with their usual concrete like lack of tensile strength, and would be expected to crack with all that water driving underneath. Maybe I’m being a bit obtuse, but how come there’s a WEST Antarctica? West of what? Doesn’t the joint cover every longitude? And is there an East Antarctica? If so, what’s it east of? Please don’t say West Antarctica. A little climate trivia: One cubic inch, foot, yard, or meter of water at 70 degrees and sea level contains about 3250 times more specific heat than an of equal volume of adjacent dry air. Just curious, but I wonder what kind of effect those major tsunamis had on these floating parts of the glaciers. Sumatra, Chile, and Japan tsunamis were quite large. Maybe not much considering distance, but just curious. Obviously, our electricity generation is releasing the evil voo-doo molecules that cause this problem, & others much like it. Keep in mind that lower case letters (in ASCII & UTF-8) have a great many more 1s than upper case, thus consume far more electricity. SO TYPING IN ALL CAPS IS THE GREEN THING TO DO. I hate ice. Good riddance. Now, I wouldn’t normally step in here to defend a warmist, but please don’t be mean to Hugs Pepper. I’m sure if you ask Dr. Pepper, he’ll tell you he has a PC, not a CV (or a Mac, for that matter). Review previous WUWT post on long-period ocean waves. If storms in the North Pacific Ocean can disturb those Antarctic ice shelves, tsunamis in the area could contribute damage, although each would only be a one-time pulse instead of an ongoing phenomenon. But as tsunamis are known for a drop in water level before hitting, which would leave ice shelves that are firmly attached to the ice on the land briefly suspended under tension with insufficient buoyancy to counter their weight, the effect could be considerable. As mentioned, it’s ice floating but gaining mass from snow, As the mass increases, the support on the seaward side decreases. It’s bound to break sometime. This article appears to be based on observations, not on model output. Be thankful for small favors! If we continue making careful observations for a couple hundred years, we may have some idea what “normal” is. Gotta start somewhere! It is a bit late to get a grip on Antarctica. Rumor has it that it’s cracking up. This range sort of – but not quite, runs along the virtual cartographic line and so the human thing to do is to apply the concept of east/west in a fuzzy sort of way, as shown in the map. The CAGW sausage factory rolls on. It’s wurst than we thought! REP – perhaps I should let you know I wanted to turn off the italics at the end of the first line! Perfecty acceptable concept; however if you take away the facts and the climistas’ pre-determined computer models, what do you have? Answer: Not much, other than a vaguely interesting minor climate phenomenom in the current inter-glacial period. As for the IPCC, let’s be nice and call this organisation as being great, apart from being totally conflicted and grant addicted. Hugh Pepper, I assume you work for a government or quasi-government organisation, so immediately your comments are conflicted because you are paid to toe the official party line, which is: ” Scare the crap out of them, so we can stiff them with more taxes.” – Do that and the grant addiction machine will work for you. I’m just glad we didn’t get pix of Al Gore skinny-dipping on his recent trip. 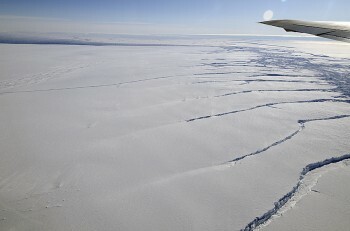 Another crack in the Antarctic? It would have been photographic evidence of Global Shrinkage. And, if Gore had an intern or massage therapist with him, it might have been photographic evidence he’d changed his position on offshore drilling. Yes, thanks for that, John. Enjoyed the pictures. I noticed the Southern Ocean is the Southern Ocean all the way around . . . puny man knows better than to carelessly toss labels about in Poseidon’s domain. Daylight saving ends in New Zealand this weekend. Kiwis administer a fair chunk of Antarctica so an hour’s less sunlight should slow down some of that ice-cracking business. Unless it’s on the other side . . . I still can’t get a handle on the place. And now that I’ve mentioned daylight saving, how come this phenomenon doesn’t get its fair share of the blame for overall global warming. I know when they brought it in some forty years ago, my old granny was dead against it . . . reckoned it was causing her curtains to fade. An extra hour of sun a day will do that . . . and damage Lord knows what else. Finally, has anyone else noticed how hard it is to type Antarctica correctly . . . I find that the first ‘c’ always has to be squeezed in later. Aren’t there international treaties against polluting Antarctica that would keep Gore from releasing his chakra? A casual reader might get the impression that this is some sort of table top exercise, being played by sophomores in a science lab. Or playing with a climate model. Does Revell® still make those in 1:72 scale? A casual reader is more likely to get the impression that this is a discussion of one small example of what the Earth has been doing quite normally for umpty-million years: changing. I find that the first ‘c’ always has to be squeezed in later. They already know that the antarctic polar vortex varies from year to year. Are we looking at another its the wind event like the Arctic event of 2007? I was looking for an over time comparison but the best I could do is this http://ozonewatch.gsfc.nasa.gov/meteorology/pv_2009.html… and this http://ams.confex.com/ams/15isa14m/techprogram/paper_125841.htm … Seems the whole of science in this area is focused firmly on the ozone hole and not what the wind patterns might be actually doing.. hrmmm go figure. The Greenwich Meridian is 0 degrees, so where that divides Antarctia splits it into west and east. Tell that to the countries in Africa with rapidly rising populations………..